If this doesn't apply to you, you are a 'New Driver'. Check on the back of your drivers licence in column 10 next to C1. If you are a new driver and need advice on what can seem a complicated process we can help! 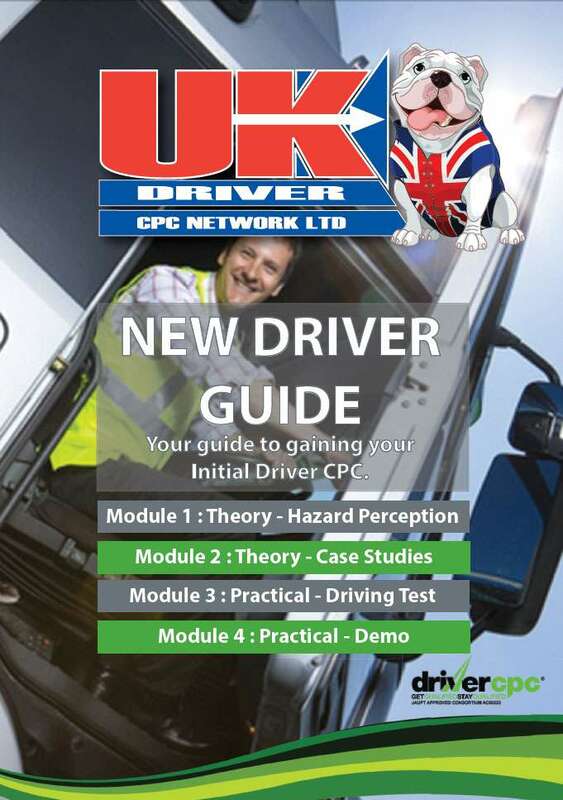 If you are starting from scratch and need all four modules or perhaps you have served in the armed forces and have completed Modules 1+3 and need to do the Driver CPC element (Modules 2+4) call us today 0191 5561004 ask to speak to Gary. We take care of managing you through the booking process and provide you with a guide to enable you to revise and understand the route to become qualified and staying qualified. total and have 90 minutes to complete the test you need 40 correct to pass. 2. Multi Response - selecting more than one choice from a number of options. 3. Hot Spot - using the mouse and clicking on an appropriate area of an illustration. 4. Audio - listening to an audio clip, then choosing an answer from a number of options. 5. Short Text- you may also be asked to provide a short text answer by using the keyboard. in your welcome email and let them know you now need them to book your Module 4.
your knowledge of load securing using a demo trolley. - Loading the vehicle with due regard for the safety rules and proper vehicle use. - Ensuring security of the vehicle and its contents. - Preventing criminality and trafficking of illegal immigrants. - Carrying out a vehicle safety check. The costs for Module 4 include test fee / hire of vehicle and for 1 hour demo before. On the day of the test please remember to bring your licence and your Module 2 pass certificate. 7 Hours of your 35 hours periodic training which will be delivered on a Monday at The Industry Centre in Sunderland. We cover the North East of England and can book you in if you live in Durham, Sunderland, Newcastle, Gateshead, Stockton, Darlington, Middlesbrough and all surrounding areas. Module 2 before you can take Module 4. Driver Qualification Card (DQC) by the DSA. We simplify things by having two routes for New Drivers. PLUS 7 HOURS PERIODIC TRAINING THROWN IN ONCE YOU PASS! We can then guide you through this process and get you booked in ASAP! We take you from start to finish. This includes downloading and completing on your behalf the two forms from the D.S.A. The first one is relating to obtaining your provisional licence, the second relates to organising your medical. Regarding the medical we have negotiated a discounted rate at a GP in Sunderland. So leave this to us as it can be cheaper for you to come through to Sunderland (if you live outside) than end up paying up to double if you go to your Doctor locally. Module 1. Once the forms and medical are complete we will book you in for your touch screen theory test - hazard perception. Once you have passed your Module 1 we will carry out a driving assessment. If you are competent car driver you will only need an intensive week long course of lessons. This consists of 5 days Monday to Friday max of 4 hours per day with one of our registered DSA instructors. The vehicle you will take your lessons in is a Class 2 Rigid "C" Category. With our package we will aim to help you aquire both C1 + C.
There are higher rates of pay on the C category jobs for the rigid lorries. This includes the £115 test fee / Hire of the vehicle / Fuel and our instructors time taking you (and the vehicle) to the test centre and back. If successful the instructor will organise sending away your provisonal licence and aquiring your new full licence. We will then organise booking you in for your Module 2 Case Studies again a touch screen theory test . You must pass this before we can then book you in for your Module 4 which again involves a trip to the test centre with our vehicle and instructor this includes the test fee / Hire of the vehicle / Fuel and our instructors time taking you (and the vehicle) to the test centre and back. The Module 4 test itself is relating to walk around checks and demonstration of securing a load. It involves a series of "show me tell me" questions. Our instructor will drive you to the test centre and beforehand will go through everything with you. For example where the washer bottles / expansion bottles are ect ect. How to check for illegal stoways if you are coming back from France. He will demonstrate how best to secure a load via a ratchet system ect and talk through how to tie down a load. Once you have passed this you will have gained both your licence (C1+C) and your Initial Driver CPC! You are then welcome to come on our 7 hours Drivers Hours / Professional Driver course which will tell you everything you need to know ahead of starting your new job! Once you pay your £200.00 deposit you will immediately recieve a great detailed guide giving you even more information and tips on what to revise ahead of your 4 tests. The balance of £1200.00 can be discussed with one of our staff members when you come in to fill in your provisional licence and medical forms. This package is dependent on you passing each module first time. Any retests (and / or any additional lessons) will be charged at the standard rate.